A Vietnamese restaurant in Dallas, Texas, has promptly changed its logo design in accordance with the wishes of the Vietnamese community in the area. The Banh Shop, a trendy new eatery on SMU Boulevard, found itself in hot water last week as a result of its questionable restaurant design, which featured a giant red star as part of its logo, behind the name “Banh Shop.” YUM! Brands, the parent company of Banh Shop, is a multi-billion dollar corporation that owns many other large restaurant chains including KFC, Pizza Hut, and Taco Bell. The redesigns came fast and were carried out extensively. The owners of Banh Shop changed not only the store logo, but also their menus and staff’s uniforms, ridding the establishment of any symbols that may be construed as an association to communism. The prompt redesigns were made largely thanks to the strong and critical response from North Texas’s Vietnamese residents, who were vocal in their refutation of the eatery’s design blunder. Widespread public criticism by the Vietnamese community, as well as the attentiveness of the business owners, were key reasons why the change came so quickly and thoroughly. According to CBS Dallas/Fort Worth News, Mr. Thanh Cung, former South Vietnamese soldier, prisoner of war, and current North Texas resident, met with the VP of YUM! Brands emerging brands division, Christophe Poirier, to discuss the matter. “Obviously, when you make a mistake, the first thing to do is apologize and fix the issue,” Poirier said. YUM! Senior VP, Jonathon Blum admits that the company had made an honest mistake and also apologizes for the mishap, according to USA Today and Voice of America. As a result, the Vietnamese residents of North Texas, the majority of which are political and religious refugees, can enjoy their Banh Shop cuisine without implicitly supporting the very same corrupted communist regime that they sought to escape from. All’s well that ends well, but the lessons don’t end there. One of the most important lessons from this event is one that has proven true throughout the ages: Your voice matters. Without the public pressure displayed by the folks of North Texas, the owners of Banh Shop and YUM! Brands never would have known of their major design blunder. 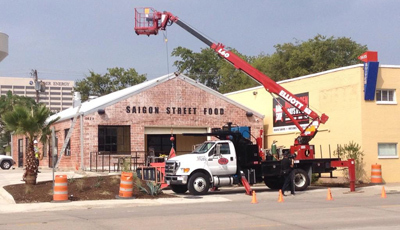 The strong will and dedication of the Vietnamese community in Dallas and the greater North Texas area were what made the changes so prompt and complete. They spoke up, they created awareness, they made the change. This story from Texas is not the only instance where things of this nature are happening. The western world has seen many occasions where the symbol of communism is wrongly displayed, both accidentally and, in certain cases, deliberately. This time, it was a large company that was simply ignorant of all that this symbol represents. There are many other instances when businesses owners, university administrators, or public officials, oblivious to the negative connotations carried by the star and the red, wrongfully decorate it on their shops, institutions, or government office buildings in an attempt to cater to the Vietnamese community. When that happens, it’s up to you to raise your voice, raise awareness, and ultimately make the change. Believe me, as an individual, your voice is one of the greatest tools at your disposal to make a change. It only took one day of petitioning and public outcry for the owners of Banh Shop to change their logo. One cannot discount the intuitiveness and professionalism of the Banh Shop business owners, but ultimately, it was the people of the community that made this change possible. Thanh Cung is the current president of the Vietnamese American Community of Greater Dallas. He is assisting the owners of Banh Shop in looking at new logo designs.